Of course, the humans couldn’t go alone. There had to be dogs. Because wherever humans went dogs came along. Like rats, only more helpful. Dogs would herd livestock. Dogs would keep watch against the unknown. And, more importantly, dogs would keep the human crew company during the long spaceflight, and on their new home, far away from Earth. I guess this is technically a “Middle Grade” book — but forget about that. Call it All-Ages instead — that way, adults and YA readers and . . . everyone can enjoy this SF guilt-free. 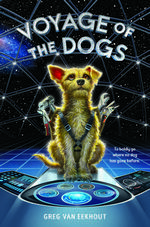 I should also include this line from The Big Idea post Van Eekhout wrote on Scalzi’s blog: “Spoiler: I don’t kill off any of the dogs in this book. Why not? Because I’m not a monster, that’s why not.” It’s important to get that out of the way. Let’s start with this: the rationale to bring dogs along on a spaceship. It’s brilliant. It also points to one of the biggest problems with Starfleet, the Colonial Battle Fleet, the Serenity, etc. A lack of animals. Sure, NCC 1701-D had pets (not that we saw them often), but they were sealed up in cabins. And Firefly‘s episode “Safe” had cattle, but that was an oddity. The animals aboard Laika are there for purposes — like the main character, Lopside. He’s there to hunt rats — where there are humans and cargo, there are rats. Something small and fast — and with a good nose — is needed to hunt rats down. The book will do a better job explaining the roles of the other three dogs and what advances in breeding have led to dogs being capable of being more than the dogs we have today — while still remaining dogs — to become Barkonauts. These poor, brave dogs go into the hibernation state just before the humans do to complete the voyage to a nearby star system as part of human exploration and colonization, the first mission like this humanity has tried. But when the dogs wake up, they notice something’s wrong — part of the ship is missing, as is the crew. They’re too far into the mission to turn around, too far away for a rescue mission to reach them. At this point, Lopside and the others have to try to salvage what they can and limp along to their final destination. Lopside is a terrier mix, he’s brave, he has (understandably) abandonment issues — which are not helped at all by the absence of the humans. He’s a little scatter-brained (like a good terrier) and he’s incredibly loyal and has a great heart. The other barkonauts are as well-drawn and lovable. Van Eekhout is clearly a dog-lover and it comes out in his characters. He’s also a pretty good story-teller, because even with that spoiler, I was invested in the outcome and really wasn’t sure how he was going to pull things off in a way that was satisfying and that wouldn’t reduce semi-sensitive 5th-graders across the globe to quivering balls of tears (a lesson Wilson Rawls could’ve used, I have to say — no, I’m not still torn up about Old Dan and Little Ann, why do you ask?). He does succeed in that — although some might get a bit misty at a point or two. It’s a fun and creative story, and takes some oft-repeated SF tropes and deals with them in a refreshing way. Ignore the stars — I can’t bring myself to give it more, I don’t know why. Pay attention to what I have said above and this: read the book. It’ll warm your heart, it’ll make you make you a little sad, it’ll give you something to grin about — and it tells a good story, too. What more do you want?